This is our most popular trip as it give easy access for people who want to experience the wildlife, waterfalls and tropical jungle that we have here in Koh Kong. A hike you will always remember with a smile! We will take you to the dock for a Long Tail boat ride, up river, into the Cardamom Mountains. The scenic river travel takes about 1hr 20min. We begin the trek to a beautiful view point, 30 minutes, then break. The trail then drops into the gorge arriving at the waterfalls where you can have a refreshing swim. Here, we will have a lunch and spend time relaxing in the tropical jungle setting with the water at your feet. After that, we will trek back to the river, 1.5 hours, have a swim and then return to the boat. Trek is light to moderate and suitable for children. Return to town about 4:30pm. 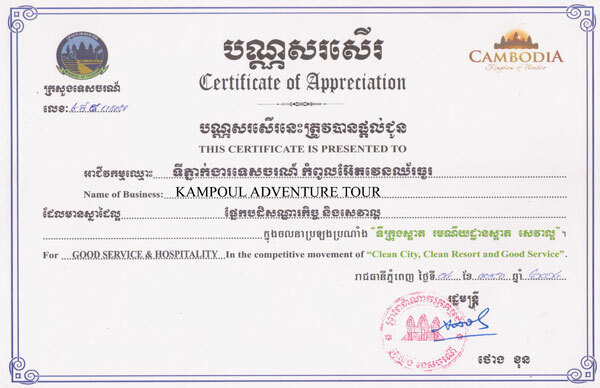 You will get picked up at your hotel for a drive to the base of the Cardamom Mountains where we park at a trail-head. We begin the hike here and travel 5 hours to a waterfall for lunch and a swim. Our return follows a different route back to the trail-head. This trek is more physical than option 1. We will drive to the trail head, 40 minutes. Trekking for 5 hours, the group arrives at a waterfall where you can cool off with a swim and a lunch break. This is the camping location where gear is dropped and you can stay here for the day or explore the jungle with a 2/3 hour trek, returning to the waterfall where camp is made. The guides will prepare a BBQ as you relax. After dark, you can go out on a night trek to observe wildlife or, enjoy camp in the jungle. As the morning light fills the canopy, breakfast will be served. After, we will take a different route, 3 hours, and return to the trail head. A 30min. drive will bring us to the Tatai waterfall for lunch and a swim. Another 30min. drive will have us back in Koh Kong, 2/3pm, and return to your hotel. You will be picked up at hotel and transferred to the dock, where a Long Tail boat will take us along the estuary to the ocean. If luck is with us, you could spot the rare Irrawaddy dolphin. The boat ride takes about 2.5 hours, depending on sea conditions. Long Tail boat will return to town early evening, 5 to 6 pm. Day trips to the island are the most popular. To get the real island castaway experience, an overnight trip might be for you. We have two options on offer. You will be picked up at your hotel at 7:40am. Take 2.5 hour by Long Tail boat to the island. Traveling along the estuary, it’s possible to spot an Irrawaddy Dolphin. At the beach, we have all day to explore, swim and sun. Snorkel gear is provided as well. Soda and beer available for purchase. You will be picked up at your hotel and transferred to the Long Tail boat for a 1.5 – 2 hour ride out to sea. With boat in position, you will have medium weight gear and use fresh bait to fish off the bottom sea floor. As all good fishermen do, if it’s slow, a new location will be motored to. Lunch will be a seafood BBQ on board and if you wish, a swim can be. A hotel pick-up at 8:15am and a 30min. drive will have you riverside to gear up. The kayaks are 1 and 2 person, open style, with no skirts. Life jackets are provided. Your guide will take you up river, 2.5 hours, to the Tatai Waterfall. Here, you can relax, have lunch, and a swim. We will stay here for 2 hours. Continue back downstream and return to the dock. Another option, if you choose, the river channel splits at the dock and we can paddle up the smaller fork passing a local Khmer village. Continuing up river, we arrive at a quiet shallow waterfall. Here lunch break while you soak your feet in the cool water. Very relaxing as you thinks about taking a nap in the jungle! We paddle up river for 2.5 hours, take a 2 hour rest, and return downstream, back to the dock.